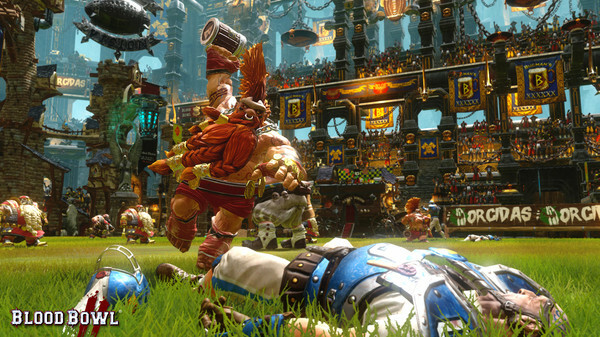 Blood Bowl 2 will delight fans of the board game, but how does it feel for newcomers? Read our review to find out. Few hobbies are as divisive as American Football and tabletop games based on the Warhammer universe. American Football is a “love it or don’t care for it” kind of sport, especially outside of the US – and the same can more or less be said about Warhammer board games. On the one hand there’s a group of people who have been playing these for over 25 years and have hand-painted Warhammer figurines sitting in a glass case that no one is allowed to touch, and then there’s a big group of people who don’t know what all the fuss is about. Blood Bowl more or less combines the two by offering a fantasy version of American Football in which orcs, dwarves and elves field teams with different play styles and attributes. Originally a board game, the action in the videogame adaptation of Blood Bowl is turn-based – and the luck of the dice play a major factor. If you’re a newcomer and were expecting a fantasy version of the old classic Speedball II, then you’ll be sorely disappointed. 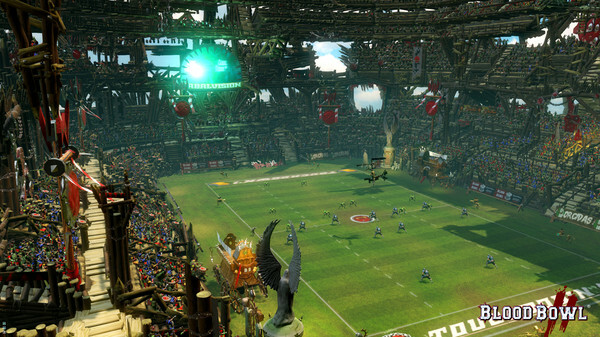 That’s not to say that the action here isn’t gruesome and in your face – true to its name, Blood Bowl delivers in this regard. The level of detail on all the players, no matter which race you pick, is excellent – as it the quality of animation once a turn ends and the action unfolds. Injuring an opponent is worth extra points, and it’s very much possible to lose your own star player to injury (or even death) during a game as well. The violence is an important element of the game and very much part of the atmosphere it tries to portray, but it’s also presented in such an over the top manner that it’s never gruesome and gory. In fact, a lot of animations have a good amount of humor in them as well, like when a player trips mid-action just when you thought he had made it past the defense. Bribing a referee is also a fun way of getting away with things, and adds to the Blood Bowl feel. For all its gratuitous violence, it’s amazing how deep of a game Blood Bowl 2 is. It’s smart to stick with a single race for a while, because the different teams are radically different when it comes to their skills, tactics and weaknesses. Elves aren’t physically imposing, but play a mean passing game, whereas the orcs rely on their physical strength to tear down the other team’s defenses. With 8 different teams to choose from and lots of different ways to approach each race (and each opponent), there is a lot to learn and enjoy here. This is perhaps also a point of criticism, because the rules and differences can be daunting to new players – especially when confronted with more experienced players in an online multiplayer match. This is a shame, because it’s multiplayer where a board game based title like this really shines. Perhaps developer Cyanide will introduce some clever matchmaking mechanics to help bridge this game, but our initial experience with online multiplayer was that most players out there had waaaay more experience with the game. On each turn, you select a variety of actions for your players that you hope will result in a successful play when you end your turn. This, however, is also largely affected by how the dice roll – although you’ll be able to lessen their impact later on when you get re-rolls and develop your team further. When a turn ends, a series of animations starts playing – old school gamers might compare these to the Battle Chess games of old. Though well done and fun to look at, they become repetitive after you’ve put in a good number of hours and take some of the flow out of the game. With its excellent presentation, deep tactical gameplay and variety in races, this is sure to delight players who are fans of the board game. As a videogame it poses a steep learning curve to those unfamiliar with said board game, and players of the first Blood Bowl videogame might want more content in terms of races – but we’re sure those will come over the next few months. If you have an interest in fantasy/Warhammer and/or American Football, then this should interest you – especially if you have access to the excellent multiplayer mode. With the depth that’s already on offer and dlc expansions that are sure to follow, this will keep you busy for months.